Sweet blue violets. There’s something about violets that just make me smile. They have a certain wild charm. These violets came from a publication by Prang & Company that was dated 1896 – at least that is what the copyright office stamp says. It is the work of Katherine L. Connor. The only online references that I can find for Conner are several other worlds of hers, mainly of flowers. 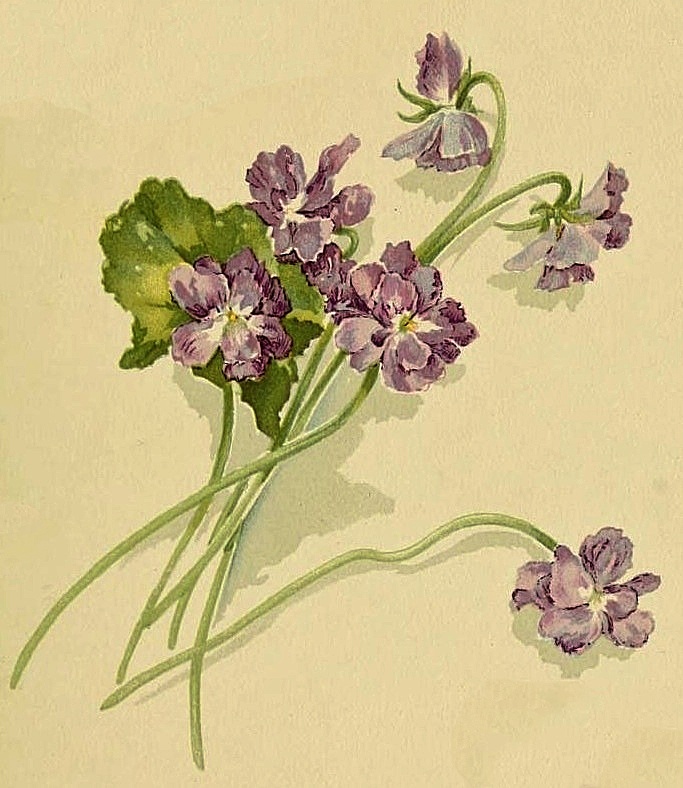 This is one of several drawings of purple violets. The booklet they were printed in was called blue violets so I guess it’s a matter of how you know them as to what you call these pretty little purple flowers. This violet drawing includes a number of blooms and a leaf stem too. I’ve included a fairly large version of this vintage drawing for you to enjoy. I think it could be used to create a repeating pattern or a variety of other Victorian style pieces. Have fun and do drop me a line so I can see what wonderful work you’ve done.